WHY THE SKYSHIP IS THE BEST MODERN AIRSHIP. 1/ It has an excellent performance in terms of load, range, endurance and speed. 2/ The gondola is made of Kevlar as used in bullet proof vests and is very tough. 3/ The environmental conditions in the cabin in terms of space and comfort are far better than in a large helicopter or other airship types. 4/ It is very reliable, easy to maintain and does not need a hangar for inspections. 5/ Although the Skyship is a modern airship it is not too high tech, which makes training groundcrew, engineers and pilots fairly easy. 6/ It is very economical in terms of maintenance, fuel and helium costs. President Obama boards Air Force one watched by a military Skyship.. Although Germany used Zeppelins in WW1 to bomb England and the US Navy used K ships in WW2 to attack U boats, no one is suggesting than an airship is suited to offensive military operations. The main use by military and security organizations of airships has been in what is called persistent surveillance. Skyships have been used to carry radar, long range visual and infra red cameras, electronic eavesdropping gear and communications relay equipment. It is also possible to fit advanced sensor systems that use large antennas that a helicopter can not carry. Phased array radar aerials can be mounted inside the envelope and even a large magnetometer aerial for mapping has been carried. Most modern medium size helicopters have an endurance of only 3 hours, whereas even a basic Skyship 600 routinely flies 12 hour patrols and it is this endurance that makes using an airship attractive. Photo: US Navy K ship escorting an Atlantic convoy in 1943. AERIAL ADVERTISING AND PASSENGER OPERATIONS. Most people are familiar with the use of airships for advertising and this is still one of the main uses of airships around the world. Many of the advertising tours also involve a significant number of passenger flights both for the press, TV crews and customers. Although a Skyship is more expensive than some of the simple small blimps it has the capability of carrying 12 passengers in a very comfortable cabin which is an important factor in some advertising operations. It is also possible to fit a high tech daylight visible nightsign for additional advertising flexibility. There have also been a number of dedicated passenger operations using Skyships in the past, even in operating areas like the turbulent Swiss mountains and breezy Sydney harbour that are avoided by most other airship types that tend to stick to flat terrain, overwater or lakes. The large removable cabin windows are very popular with passengers in warm climates. Skyship 12 passenger cabin with toilet and drinks bar aft. This picture of the Macon illustrates that including a frame as part of an airship design makes construction very complicated, because it needs to be ultra lightweight but flex in a similar way to the envelope that is attached to it, without causing it to tear or chafe. It was not possible to build a large non rigid airship the size of an old Zeppelin, because the materials available at the time were too weak, however modern rip stop pattern envelope materials have increased in effective strength 4 fold in the past 10 years alone, so there really is no need to include a frame for a modern airship. Blimp designs are also much more flexible in turbulence and there is no need to be concerned that fatigue or overstress failure of a frame member will result in a serious tear of the envelope or gas bag attached to it. 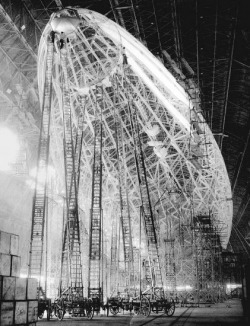 Zeppelins including semi rigid designs in particular, can suffer both from frame failure and envelope failure problems, whereas modern non rigid airships (Blimps) only have to be concerned with the condition of the envelope and ballonets. Including any type of frame, even for a semi rigid design, roughly doubles the cost of construction. CIVIL: Promotional, Camera, Sightseeing, Leisure, Skylab and Survey. OTHER POSSIBLE ROLES FOR SKYSHIP 1000: AEW, ASW, MCM, C3I and RISTA.